Our Lady of Brexit? Why not consecrate the UK to the Immaculate Heart of Mary? It has been announced that Scotland is to be consecrated to the Immaculate Heart of Mary “for the first time”. It is believed that the act will set Scotland apart for a sacred service, renew the faith of all Scottish Roman Catholics, and entrust all non-Catholic Scots to the care and protection of Our Lady. Quite why Scotland has had to wait so long isn’t entirely clear: England and Wales were consecrated to the Immaculate Heart of Mary in 1948, and re-consecrated in February of this year. “When England returns to Walsingham, Our Lady will return to England,” said Pope Leo XIII. The cart appears to have come before the horse. The practice of Marian consecration and entrustment is centuries old, but it is a curiously arbitrary, if not incoherent thing. Why specifically consecrate Scotland or England & Wales to the Immaculate Heart of Mary when the whole world was consecrated by Pope Pius XII in 1942, and re-consecrated and re-re-consecrated by Pope John Paul II in 1982 and 1984, and re-re-re-consecrated by Pope Francis in 2013? (What is this reiterative consecration? May a man be re-consecrated a bishop? May bread and wine be re-re-consecrated in the Eucharist?) If the whole world has been consecrated multiple times to the Immaculate Heart of Mary, does that mean the United Kingdom has been latently consecrated? Is an implicit consecration sufficient? The consecration of March, 1984, was done in front of 250,000 pilgrims. Again, the pope consecrated “the world” and hinted at Russia, as we have seen above. But moments after the consecration, John Paul II added some unscripted, off the cuff remarks, in which he implored Our Lady of Fatima to “enlighten especially the peoples of which You Yourself are awaiting our consecration and confiding.” These statements appeared on the cover of the March 26th 1984 edition of L’Osservatore Romano. If the entire world and the human race had just been consecrated by the pope, who on earth could possibly be “awaiting consecration and confiding”? In making this statement, the Pope was publicly acknowledging that the consecration requested by Our Lady had still not been performed. And yet many nations were not specifically mentioned. Where was China or India? Since this was 1984, where was specific mention of Czechoslovakia, Yugoslavia or East Germany ? Who determines which sovereign states merit consecration to Mary, and which have to be absorbed by greater political or geographic entities? Why Scotland and not Serbia? Why England and Wales but not Quebec? Why not England without Wales, or Wales without England? Does a pope really have to list all the nations of the world in order for global consecration to be efficacious? Does a presiding bishop have to name the specific country/region which is being consecrated in order that “Our Lady’s request” might be fulfilled? The pre-event blurb specifically stated that Cardinal Nichols would re-consecrate England to the Immaculate Heart of Mary. He did mention in his sermon that he was going to ‘re-consecrate ourselves and country’ at the end of the Mass, but when we read the re-consecration prayer in the brochure that he actually recited, it didn’t actually mention England at all. It seems to be a problem with those affected by the post-conciliar diabolical disorientation – they can’t actually understand that a nation/person/place/item to be consecrated, has to be specifically mentioned as being the object of the consecration. Hence, Russia still not being consecrated. There is clearly some intra-Catholic division about this. Yet it is curious that Ireland (‘All Ireland’) has been consecrated, England & Wales have (has?) been consecrated, and Scotland is about to be consecrated. What is this divide and rule? Seriously, why has the United Kingdom of Great Britain and Northern Ireland never been consecrated to the Immaculate Heart of Mary? There is manifestly precedent for the consecration of political unions and geographic locations or even entire regions. Canada (created in 1867 with the federation of New Brunswick, Nova Scotia, Ontario and Quebec) was consecrated in 1947 and re-consecrated 1954, and re-re-consecrated in 2017. Europe was consecrated to Mary in 1309, and re-consecrated in 2003 “so that the Holy Virgin may make Europe a concert of nations committed to building together the civilization of love and peace!”. And the entire Middle East was consecrated to Mary as recently as June 2017. Surely if a region as politically disparate and religiously divided as the Middle East may qualify as an entity worthy of Marian consecration, why not the United Kingdom? If a political federation created in 1867 may be consecrated, why not one which was forged in 1707? 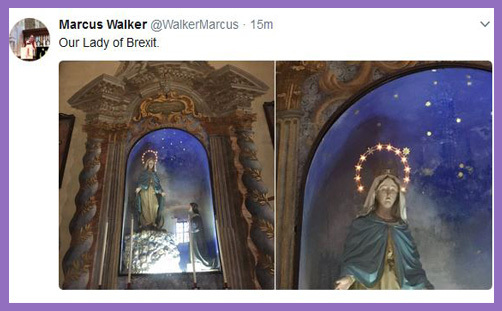 ‘Our Lady of Brexit’ may have been a humorous, demob-happy tweet from the outgoing associate director of the Anglican Centre in Rome, but those 12 stars on the flag of the European Union are the same as those on the flag of the Council of Europe, which are thought to have been inspired by Mary’s Corona Stellarum Duodecim. The Council of Europe was founded in 1949 and has 47 member states. It predates the European Union (currently 28 member states) by 44 years (or eight years if you bypass the Treaty of Maastricht and revert to the foundation of the EEC in 1957). The UK is leaving the EU: it is not leaving the Council of Europe. Perhaps 31st March 2019 would be a good date for the Cardinals of Scotland, England, Wales and Northern Ireland (‘All Ireland’) to come together to consecrate the United Kingdom to the Immaculate Heart of Mary (or just to the Blessed Virgin Mary if you don’t go in for that ‘immaculate’ stuff). It doesn’t matter a fig to Protestants (or atheists, humanists or followers of other faiths), of course. But every Brexit-supporting Roman Catholic along with all Mary-venerating Anglicans would be positively overjoyed, if not profoundly encouraged in their devotions and renewed in their reformed faith.